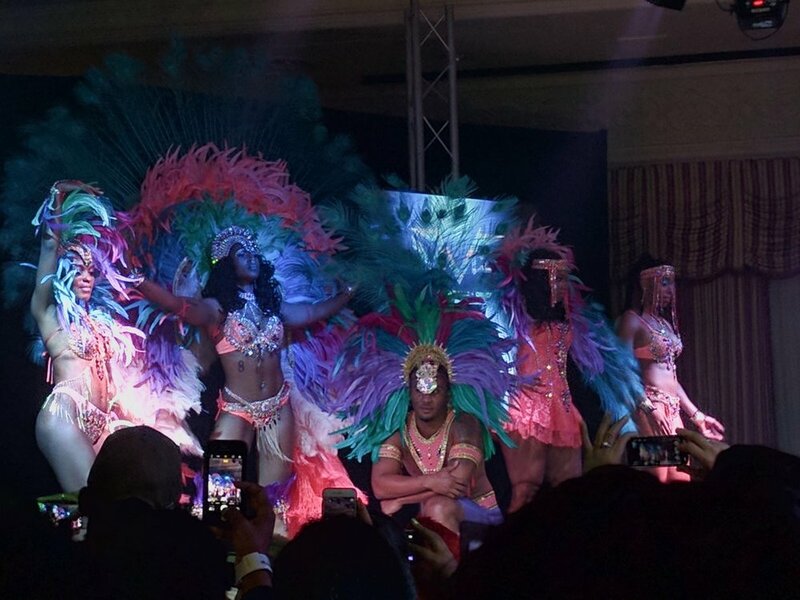 With Trinidad Carnival fast approaching and noted outrage over what seems like discriminatory practices, such as requesting photos and personal information to get into fetes and mas bands, it's good to see a carnival that is taking steps to be inclusive. Now in its third year, Bermuda Carnival is trying to carve out a name for itself among the world's biggest mas parades. This is no easy task considering that the organizers faced push back from a community that does not see itself as culturally Caribbean despite many residents having familial ties to the region. To combat this impression, Jason Sukdeo and the BHW Ltd. team have been on a mission of outreach. On January 7th, an open panel discussion was held to allow residents to ask questions, voice their concerns, and get advice on how to use the Carnival to grow their businesses. When asked about an ideal future of Bermuda Carnival, co-owner of Mastamind Productions Natasha Andrews stated that she would like to see more promotion from government and tourism sources. It's important to use the Carnival as a tourist attraction and to encourage visitors to patronize local businesses. International recording artiste GBM Nutron wants to see more music come out of the island. "I would love to see what Bermuda has to contribute to where [soca] is going." The traditional Gombey rhythm can be incorporated into the music to create a unique sound. It would also be good to see Bermudian soca artistes emerge the same way the deejays are gaining prominence. Deejays like Rusty G, who was featured on the Uber Soca Cruise and leads Intense Mas Band (the official band of Teamsoca.com), as well as Sukdeo himself, who uses the monicker D'General when deejaying at the Sun, Rum, & Soca party series in Harlem. Designing Daryl, the visionary behind the Aurora section for the reigning Band of the Year Nova Mas, hopes to see a unique mas. He believes that designers can be inspired by Trinidad Carnival without trying to imitate it. "We don't just want bikinis and beads. We want more coverage. You're coming here to play a mas not show your... ."
The runway show on January 8th definitely held to that theme. Each band presented at least one costume designed for full-figured women. From front line to back line, there were offerings for women of all sizes and skin tones. Costumes range from $250 USD for a back line costume to $700 USD for front line. Masqueraders can purchase a costume and add accessories from other lines as desired. Ultimate Treasures costumes run up to size 3XL and include fete tickets in the costume price. Party People, Code Red, and X-plosive Mas also offer costumes that are not just able to fit larger women, but are designed with them in mind. Designers and band leaders say they want as many people to participate as possible. Makes sense, right? For those who have been to Bermuda Carnival in the past and had any issues with finding hotels or getting back from the Carnival parade route, the government is working to ensure additional housing options and adequate transportation to accommodate visitors. Because tourists cannot rent cars it is imperative that the transportation issue be resolved. As a socaholic, fete specialist, Carnival junkie, I am excited for Bermuda Carnival! Last year, I was a spectator, but this year after seeing the costumes, I might just play ah mas. Book your ticket, find a band, and leh we go to Bermuda from June 16-19th! Stay tuned to BermudaHeroesWeekend.com for more information. Newer PostIs A Rankin Ting or What?